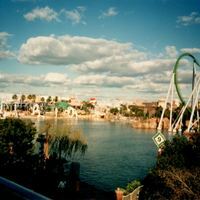 Universal's Islands of Adventure, located at 6000 Universal Boulevard in Orlando, Florida, in 2001. The Incredible Hulk roller coaster can be seen to the right of the photograph. Part of Universal Studios Florida, the theme park opened on May 28, 1999. The idea for Islands of Adventure were first conceived in 1991. By 1993, plans were being announced. Construction began in 1997. Original color photograph, 2001: Private Collection of Nancy Lynn Cepero. Digital reproduction of original color photograph, 2001. "Universal's Islands of Adventure ." Universal Studios Florida. https://www.universalorlando.com/Theme-Parks/Islands-of-Adventure.aspx. "History of Universal Orlando." OrlandoVacation.com. http://www.orlandovacation.com/universal-studios/articles/universal-theme-park-history/. 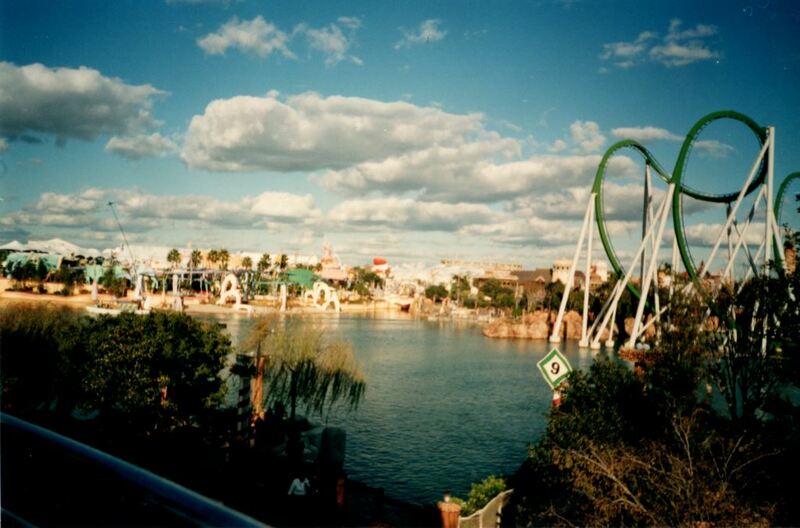 “Universal's Islands of Adventure, 2001.” RICHES of Central Florida accessed April 20, 2019, https://richesmi.cah.ucf.edu/omeka/items/show/4441.